← how do you stop swearing? Anyway, I have looked through and enjoyed reading all the submissions! I have already selected the winner and will announce the result in the coming days, together with the winning entry! Keep your eyes peeled on this blog because for the first time in my blogging history (do allow me to self-hype), I will publish someone else’s writing in its entirety! Nonetheless, since it’s my competition, I will bend my rules and declare that I still accept entries until 20th May, but the bar has been raised and any subsequent entries would have to better the existing ones by a mile! On a more serious note, I humbly request that you keep a few of us in prayer, as the Spirit leads you, over the next few days. ET, SW, TT, NL, LS and KJ, together with KK and I, will be at a camp called iJourney, from Monday to Wednesday. This annual programme is conducted for the Secondary 1 Normal Technical students and selected Secondary 3 student leaders from Dunearn Secondary School. It’s a great opportunity for us to plant seeds in these young lives, as well as to be demonstrate Christ-like testimonies for them. I have already written in advance and have scheduled daily posts to (still) be published at the stroke of every midnight. So if you keep reading and commenting, I will surely keep writing. I told LK that writing daily has become such a habit that this catharsis is turning into an obsession. And I think it’s a good one. For now, I think it’s time to kill the monotony of words and to colour the blog. 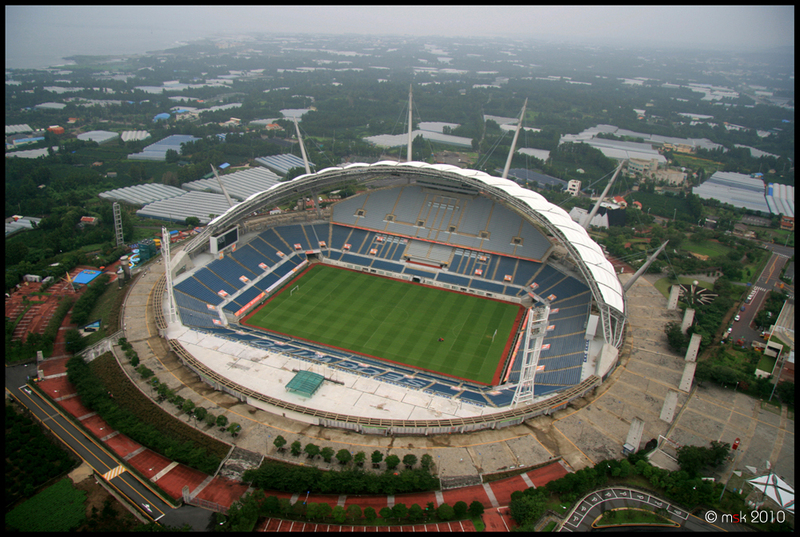 I took this picture of the magnificent birds’ eye view of the Seogwipo World Cup Stadium in Jeju, South Korea, when I was atop the hot-air balloon. I remember telling myself that this would be the closest that I’d ever get to any World Cup. This is the breathtaking scenery 150-metres above ground! Enjoy! Posted on May 16, 2010, in Affirming Faithfulness, Extraordinary Mundane, Ooh Aah Cantona, Picture Perfect, Simple Pleasures, The Greatest Gift and tagged attitude, birds' eye view, blog, catharsis, Christ-like, colour, comment, competition, daily, Dunearn Secondary School, Elissa Tan, Holy Spirit, hot-air balloon, iJourney, Jeju, Jesus Christ, Kenneth Kwan, Lim Kun Jie, Lim Leng Shan, Lionel Koh, mentality, midnight, monotony, Nicole Liang, obsession, plant, publish, read, Seogwipo World Cup Stadium, Serene Wee, South Korea, submission, testimony, Tiffany Tay, winner, winning entry, World Cup, write, young people. Bookmark the permalink. Leave a comment.